When ten criminal acts collide, what's going to happen!? Since it is a gag manga you shouldn't expect too much from its plot.However, it has its own twist and turn in a very comedic way that will make you laugh until you cry. Yamauchi-sensei has his own unique art style.It may not be brilliant but it fits well with the comedic aspect of his manga series. This is where Yamauchi-sensei talent shines most.All characters are really funny.No character will dissapoint you.Their various facial expression and idiocy will make you laugh. If you're looking for something that will lighten your mood then look no further this is the manga for you. 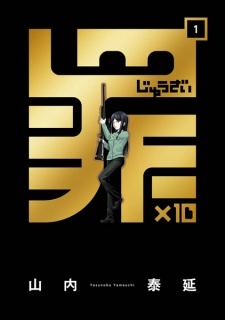 Zai x 10 is 100% a gag manga which honestly reminded me of gintama minus all of the good action and meaningful plot. There is a story but its very minimal and it begins in the first volume where you are introduced to a bunch of women who are in situations were crime is happening and a bunch of Gintama-esque situations and jokes play out. All of these girls cross paths and at the end of volume one, they all converge and have this "big" ending and thats really the end of that. The characters are reused in the future because it would be a hassle introducing new ones but the plot stays behind. overall it was decent. honestly i wouldnt read it again or recommend it to anyone because it wasnt anything to write home about, it was just something quick to fill time. because its all gag and no real substance the jokes and stuff can get a bit old. it just really reminded me of gintama and then in that case you should just go and watch/read that because its way better than this. The anatomy and proportions checked out. The environmental and panoramic shots looked about average. The overall art was a huge upgrade from (I'm going to call this author Bomber Grape because that's what he goes by now in the doujin community) his previous published work, NichiBros. Bomber Grape's art in his previous work was a bit...eh...The art quality in this manga however is noticeably better. There were a lot of supporting tones and details to make the art pop out. The unique style of face and expressions are what made a lot of the gags funny. While there weren't too many impact shots or artistic skill showcases in this manga, the art successfully made a lot of the gags hilarious. The panel progression was mostly average and a lot of the layouts actually seemed a bit on the low-effort side. That's fine though. There wasn't too much use of panel cutting or attention to panel layout so there wasn't too much flair to the panel progression as a result. The pacing was just right and the jokes seemed fleshed out well. Furthermore, the recurring jokes and setups were appreciated. Actually, the recurring jokes and repetition of some of the panel designs made some of the jokes funnier. For example, the first shoplifting gag was much funnier when the "re-entering on the dressing girl" was reused. The characters made this manga. The characters are important in a gag manga in my opinion and they all did a great job in keeping things entertaining. Character development isn't too important to me in a gag manga. I just really like how well the characters seemed to make the gags work. The backgrounds and personalities of each of the characters were interesting and they all added to the scenarios they were in and the gags they were able to create. The character designs were funny and interesting as well. To not sound too bias, for example, the dynamics between the two kidnappers and the girl they kidnapped created a good atmosphere for a lot of gags. Their interactions simply didn't end with their first gag. They were shown to hang out. They were shown to have some crazy fights and gags. The airliner lady's story didn't end with her first gag. Her gag was fleshed out more and more and it just seemed to work. The manga even went on to connect each of the characters one way or another. For example, the ribbon collection quest or how the assassin chick being an old classmate of the kidnapper. The plot was fun. Bomber Grape did a great job in setting up multiple plots for each of the characters. Each chapter felt like its own story and as a result made the gags fresh. The recurring nature of the gag setups made it so that the reader could connect with the characters on some level. The interesting plots such as bank robbery, tax evasion, kidnapping, etc. were individually unique, but were all a part of a bigger theme which is something I liked. The conclusion was abrupt but I was fine with it. I don't expect too much from a gag manga of this nature. I just personally would have liked some lead-up or proper conclusion to each of the characters. A letdown of a conclusion because I really would have liked a finale to each of the character's individual plots. Bomber Grape has quickly become one of my favorite mangaka because of both of his published and doujinshi works. His art style and the way he does gag manga is very unique. To me, his gags and they way he supports those gags with his artstyle are a joy. This manga is definitely worth a read if you want a lighthearted and hilarious "wtf am I reading" experience. My favorite parts are the shoplifter girl and the police woman girl.